Taojiashanultra-high pressure eclogite is located on both sides of 318 National Road, about150m to west Taojiashan in Sanmenhe Township of Yingshan County. Thesurrounding rocks are Mesoproterozoic-Neoproterozoic Dabie diamictite(Ar3-Pt1),which are mainly residuals of granitic gneiss and amphibolite (some arehornblende pyroxenite). At the edge is often amphibolite and in the center iseclogite mainly composed of garnet and omphacite. The inclusions of coesite(illusion)in garnet are visible under the microscope. 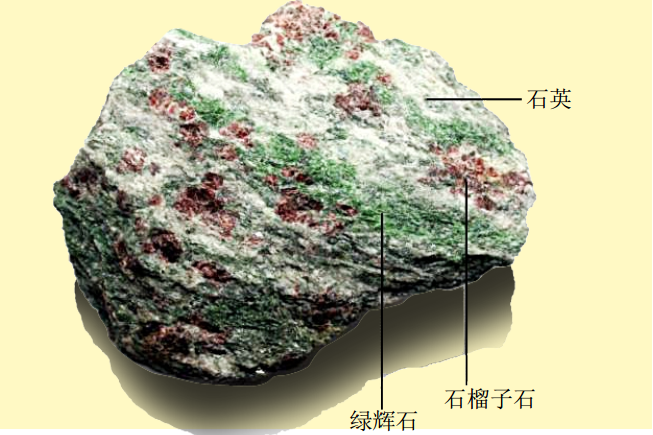 Eclogite with a weak migmatizationand interlaminated with granitic and pegmatite dykes is the product of theIndosinian subduction-collision between the North China Plate and Yangtze Platein the Indosinian Period.